Enjoy a leisurely paella cooking experience in Palma and Mallorca’s countryside on this 7-hour tour. Scout out ingredients at a Palma food market, and ride a public bus to the Sierra de Tramuntana mountains. 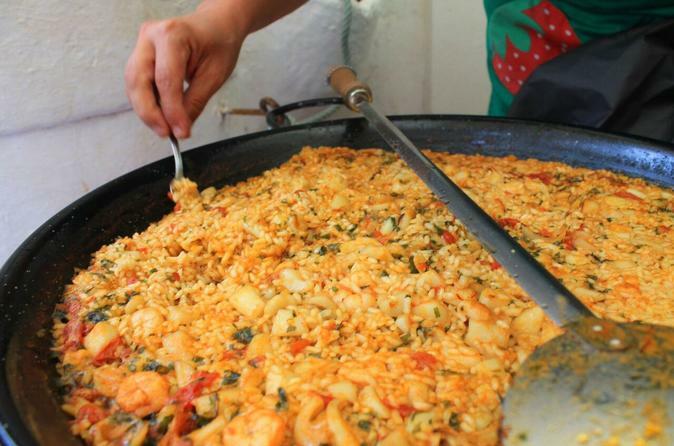 Meet your cooking host at their village home, and learn to make a classic Mallorcan paella. Take your time to cook and savor your paella for lunch with wine and a ‘hierbas’ liqueur. Return bus fares, ingredients, snacks, and lunch included. Meet your guide and group of nine or fewer in central Palma. Then, set off for the Olivar Market (Mercat de l’Olivar), the food market that’s been at the heart of the city for more than 60 years. Prepare yourself for the assault on your senses that awaits, and weave through the stands of fresh produce, spices, meat, and fish. Help your guide choose the best ingredients for your Mediterranean paella, chat to vendors, and get ideas for places to shop and eat later. Your visit will be leisurely, so there’s time to take photos and purchase some goodies (own expense). Next, hop on a public bus with your guide and travel through countryside to the Sierra Tramuntana, a mountain range designated as a UNESCO World Heritage site for its natural beauty. Hop out at a village and be welcomed into the traditional stone home of your friendly cooking host. Then, depending on the weather, head into the outdoor yard or kitchen for your class. Practice some simple tasks as your host talks through making an authentic paella, and set about prepping the ingredients. Your class is measured and slow, with time to understand each step and the role of each ingredient. While you cook, take time to savor the aromas, flavors, textures, and colors, and refresh your energies with tapas snacks, and a beer or soda. Savor your finished dish for lunch alongside Mallorcan wine, a home-made dessert, and tea or coffee. Lastly, finish in true island style, with a glass of home-crafted hierbas — the local aniseed-flavored digestif. As you eat, chat about your cooking efforts, Mallorcan cuisine, and your time on the island. Then, bid farewell to your host and take the bus back to central Palma, where your tour finishes.